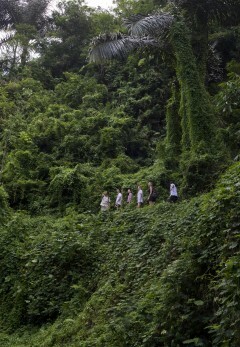 Get a taste of the unique Balinese culture and history on this short day trek to the village of Taro. During the 2-hr trek, you'll explore ancient temples, hike through fields of rice paddy and trek across endless plantations of bamboo. You'll be accompanied by an expert tour guide who'll introduce you to the culture and history of the island community, with popular tales and stories. After an exhilarating trek in the backwoods of Bali, you'll end the tour at the Koko Bambu Restaurant, where you'll have delicious lunch. Before the day is over, you'll also take a tour of the nearby Mason Gourmet Chocolate Factory. Located in Central Bali, the village of Taro is one of the oldest Hindu villages in the country, with a history that dates back centuries in the past. With a rich history of Hindu culture, the village is steeped in tradition that expresses itself in popular legends and stories. Apart from hosting one of the oldest temples of Bali, the temple is also known for the sacred White Cows, a type of albino cattle. The trails that meander through the village and the surrounding rice fields and jungles offer a scenic trek on a short itinerary, perfect for a travellers looking for a quick getaway into nature. 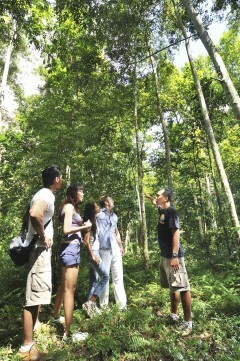 • Go on a short, 2-hr trek in the dense forests of Bali. • Take a tour of paddy fields and bamboo plantations. • Get photogenic views of the Balinese countryside. • Learn about Bali's rich history and culture at Taro. • Visit a gourmet chocolate factory. 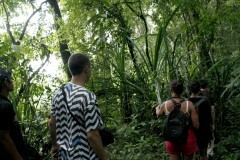 Travellers are required to follow instructions of the trek leader during the Bali trekking trip. Consumption of alcohol, drugs or tobacco products like cigarettes is strictly prohibited during the Bali trekking trip. For cancellations made more than 2 days before scheduled date of the Bali trekking trip: 90% refund. For cancellations made 2 days or less before scheduled date of the Bali trekking trip: no refund. All cancellations will be processed after deducting a transaction fee. Please check with us what these charges will be for this trip. You'll be picked-up from your hotel in Bali by 7:30-8:00 hrs from Nusa Dua, 7:30-8:00 hrs from Kuta/Seminyak, 8:00-8:30 hrs from Sanur and 8:15-8:45 hrs from Ubud. Bookings for children aged 5-12 years are charged at a discounted price of INR 3,000 per person. Bookings for children older than 12 years are charged at full price. Travellers from outside Indonesia are requested to carry enough cash in the local currency to cover any incidental and personal expenses. 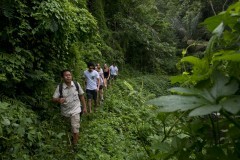 Go on a short day trek in Bali! You'll be picked-up from your hotel or place of accommodation in Bali in a private vehicle. A short drive later, you'll arrive at the start point of the trek. During the 2-hr trek, you'll explore the village of Taro, hike through fields of rice paddy, trek across endless forests of bamboo and admire old architecutre at temples and monuments. 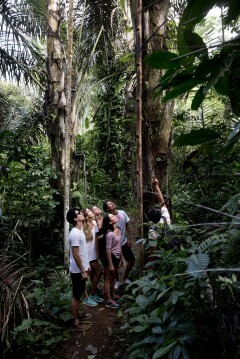 The trek ends at the Koko Bambu Restaurant, where you'll have delicious lunch. Before the trip is over, you'll also visit the neighbouring Mason Gormet Chocolate Factory to take a tour of the factory floor. You'll be dropped-off at your hotel by 16:00 hrs. Your trip ends here. 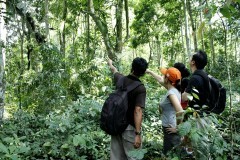 Spend a day in the heart of forests covering the Balinese highlands. Hotel pick-ups begin by 07:00 hrs. Today's meal package includes lunch at the Koko Bambu Restaurant, served after the trek. Hotel drop-offs end by 16:00 hrs. Bali is well-connected to most major cities via frequent flights to the city's Ngurah Rai International Airport. You'll be picked up from your hotel or place of accommodation in Nusa Dua, Kuta/Seminyak, Sanur and Ubud. 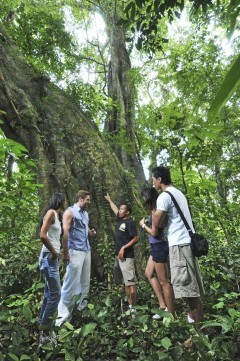 The tour operator will arrange your transport to the start point of the Bali trekking trip.